I haven’t bought a new Matchbox for my collection in quite some time, mostly because they don’t currently make any of the Chevys I collect. But I’ve been really impressed with the quality and detail of many of their recent models and have been itching for an excuse to buy something. Just last weekend I was online and saw a photo of the 2019 Matchbox NASA Mission Support Vehicle. When I went to a WalMart later that day, I found one hanging on the pegs. It makes a really nice addition to my relatively small sub-collection of NASA vehicles. Express Delivery – the original name of the casting used here – made its debut in the 2010 City Action series. First released with a metal body and open front doors, it was modified in 2011 to have closed front doors and a plastic body. While the model has a long window on top and an opening rear door, it doesn’t appear that there’s much inside the van to see. I guess I’ll have to buy a second version and free it from the package so I can find out for sure. Other NASA themed items in my collection include a few Hot Wheels Action Packs and the Hot Wheels Mars Rover Curiosity. After I found this Lesney Matchbox boat trailer recently at the Wichita Community Market, I went on a search for a boat to make it complete. I did a similar thing a few years ago when I found a loose Lesney Matchbox Jennings cattle trailer, reuniting it with a Thames Trader cab to make the Major Pack 7. I did a search on eBay and, sure enough, there were a couple of loose boats. I landed this model, in good shape but with just the right amount of residual grime to match the trailer. I believe the dull blue boat paired with the black plastic wheels on the trailer makes this the earliest variation of the #9 Boat and Trailer, which was first released in 1966. In 1969, the trailer was given Superfast wheels, and there are about 13 versions of the Boat and Trailer, with differences in boat color and decoration, as well as trailer paint color and wheel type. The next part of the project was to find a nice tow vehicle. My first thought was to find an old Lesney station wagon, but when I realized that my Lesney Matchbox Land Rover Safari had a tow hook, I decided I already had just what I needed. While making a run through the Wichita Community Market last month, I came across a shelf full of cars. Normally I would have passed on some of these, but the man at the booth was determined to make me a deal on the entire lot. We settled on $12 and he was even nice enough to find me some newspaper to wrap them in. The cleanest of the bunch, with all of its plastic parts intact, is this Hot Wheels Super Cannon. The casting first appeared in 1982 as Megadestroyer 1 and Megadestroyer 2 – merchandising for the movie Megaforce. This model is the first variation of Super Cannon from 1985, with 5 variations to follow. In 1996 it became Enforcer, which is still going strong and can be found in about two dozen more variations. With its black blackwalls, it makes a nice companion for my 1985 Hot Wheels Tank Gunner. Earlier this year, I landed a Hot Wheels Malibu Gran Prix on eBay. This one is the identical version from 1982, except that it is even more playworn and was cast in Malaysia rather than Hong Kong. Someday I’d like to have a nice example of an early blackwall Hot Wheels CAT Forklift in my collection, but this is not it. 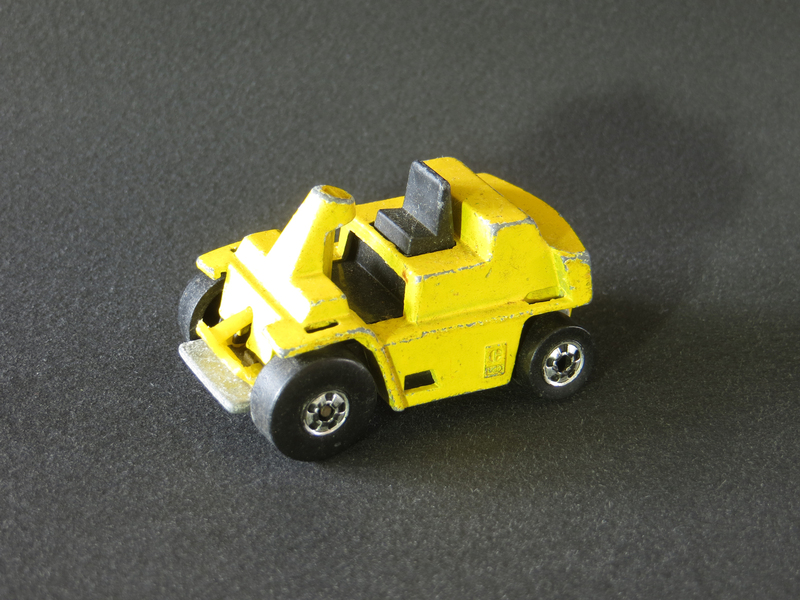 Although it is the 1981 variation with Cv80 cast into the sides, it is missing both its yellow plastic forks as well as the black plastic roll cage. 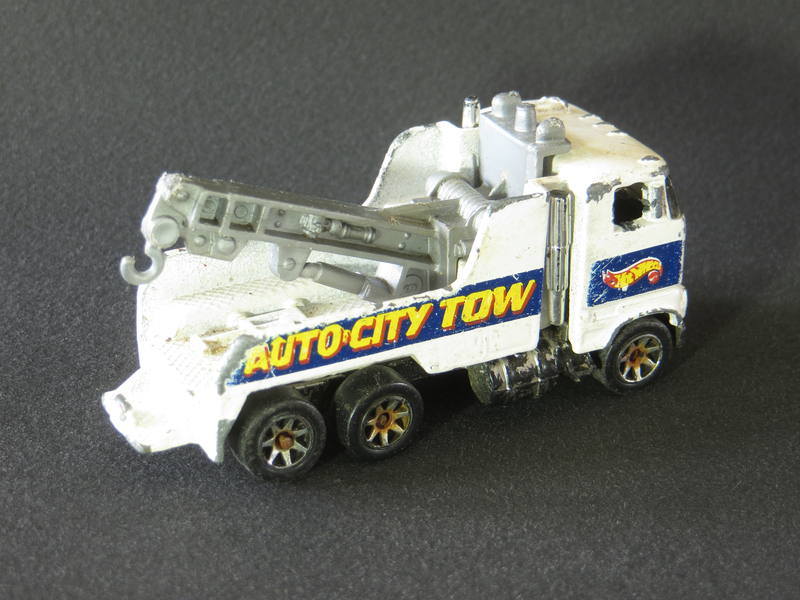 The only other Hot Wheels forklift I have in my collection is the Marcus Construction version from 2000 – though I do have a nice Matchbox forklift from my childhood collection. 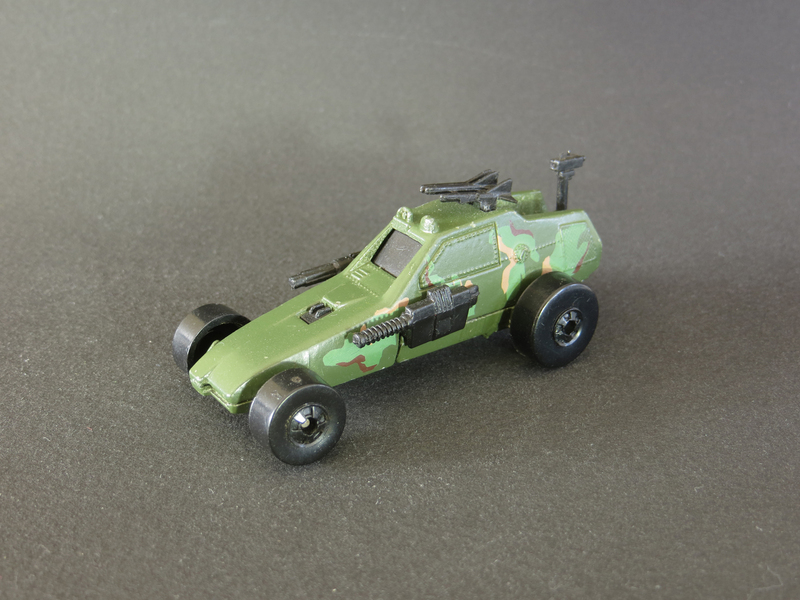 Another Hot Wheels casting I’m familiar with is the Rig Wrecker. I have a fun but playworn blackwall version from 1983 as well as the airship tug from my excellent 1994 Blimp & Support Team 5-Pack. 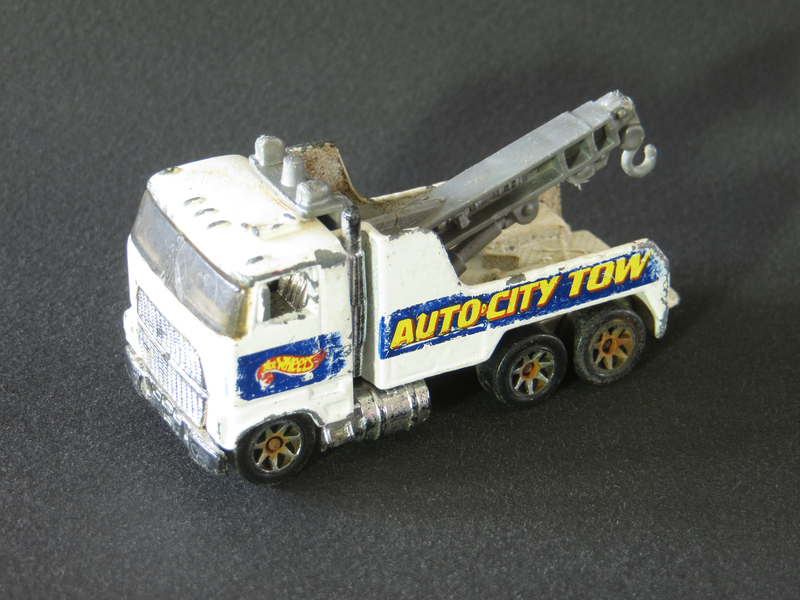 This particular 7-spoke Rig Wrecker is from the 1997 Hot Wheels Auto City 5-Pack, which would have included a Fire Eater, Sheriff Patrol, Mazda MX-5 Miata, and a Peterbilt Dump Truck. 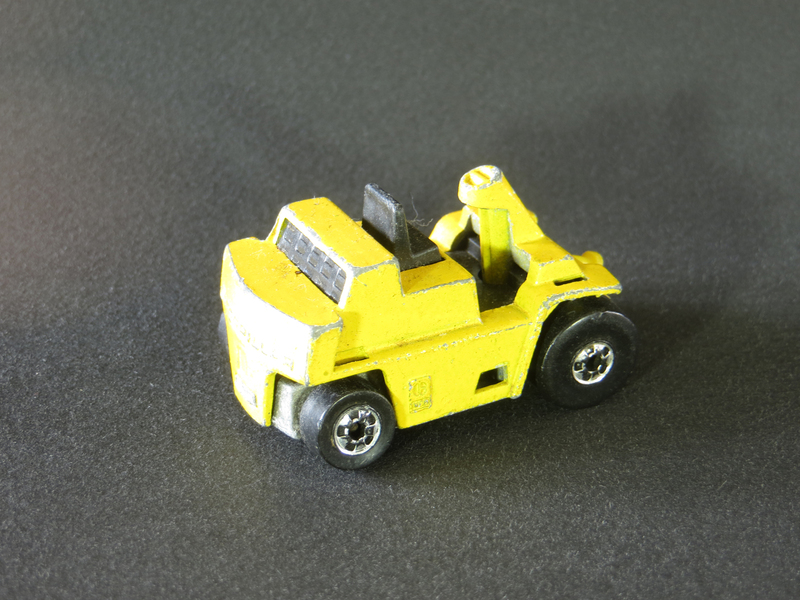 This next item is from the 1966 Matchbox #9 Boat and Trailer – minus the boat, obviously. As soon as I figured out what it was, I was determined to find it a mate. Stay tuned for an update on this soon. I still have some Playart models from my childhood collection, but I rarely find them around these days. So I was a little surprised with the next three of the lot, which are all Playart. In fact, I have a version of this same fire engine, but on my childhood car, only the cab and base of the model are metal, with the back being red plastic with a chrome plastic insert and a white plastic ladder. On this flea market version, both of the back parts are diecast, making the whole thing quite a bit heavier than my childhood car. It makes me wonder if the missing ladder would have been diecast as well. Also notice all three of these Playart models have the flower wheels, while some of my childhood Playarts had black wheels with a chrome plastic hub. This Playart Cement Mixer is missing the plastic mixer as well as the entire windshield. This Playart AEC Routemaster Double-Decker Bus is missing the upper level. This model could be found in a variety of liveries, including a Kentucky Fried Chicken version. Another Playart model from my childhood is the Playart Kubelwagen. The only other Playart model I have is an orange Lamborghini Marzal. This next item is the Zylmex Wheaties Van, which was a mail-in promotional. This custom Dodge van is missing a lot of its paint, its plastic grille, and most of the decorative decals. I also have some Zylmex models from my childhood – a bunch of the M*A*S*H series. You can read more about Zylmex and see some of my other Zee Toys here. 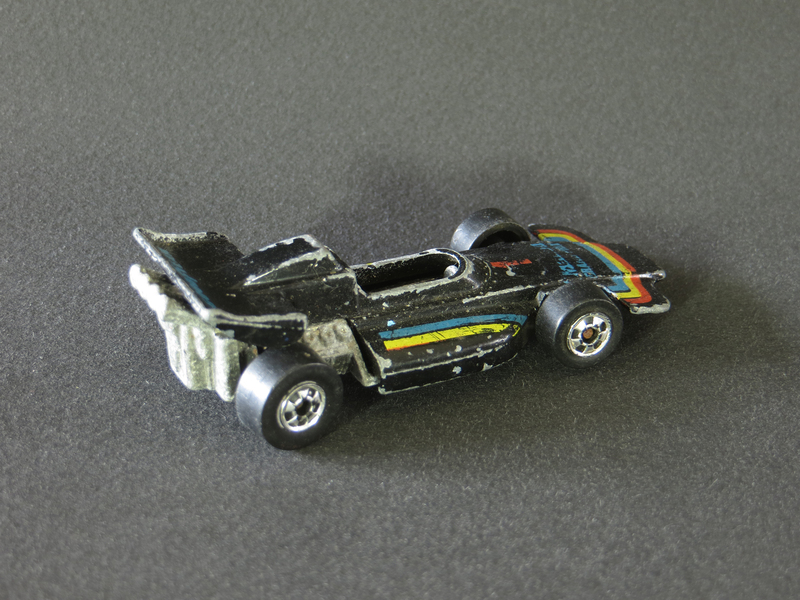 And finally, this last item is a Summer Marauder Can AM Racer, also well-worn and missing its windshield and driver. You can see a few of my other Summer models here. 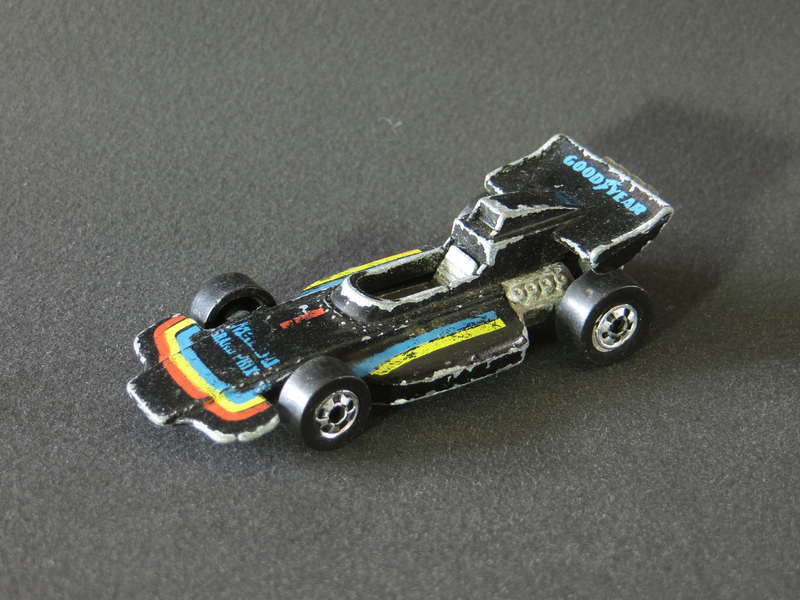 There is a current posting in another online forum about this car, the 1975 Matchbox Cosmobile, where it is described as a “horrible generic” and an “awful fantasy.” Even the originator of the post has to dig deep to “say something positive” when he admits that he likes the particular shade of blue paint. I admit, when I was a kid, I preferred more realistic cars. But as I’ve gotten older, I find these fantasy castings really interesting. Put yourself in the designer’s shoes and imagine the challenge of creating a vehicle that’s really cutting edge for the time. Looking back at it now – 43 years later – even though the Cosmobile is obviously supposed to be some kind of futuristic vehicle, the awkward angularity may have only predicted the automotive design of the 1980s (think Chrysler’s K platform or the Toyota Celica Supra). It may not be a classic beauty, but I think it’s an awful lot of fun. The Cosmobile could be found in upper body paint colors of metallic red, metallic avocado, and metallic blue, with differences in lower body, interior and window colors, creating a total of about 8 different variations. And, by the way, the lines also remind me a little bit of the Stretcha Fetcha from my childhood collection. I spotted this 1966 Matchbox Ford Galaxie Fire Chief at the Shopkeepers Antique Mall awhile back. I debated about it for a week or so, but eventually went back for it. Since the Ford Galaxie was the main competitor to my beloved Chevy Impala, I thought it should be represented in my collection. This Matchbox model represents a 1965 Galaxie, the third generation of the full-size car. The variation of the Fire Chief car with a red roof light is worth quite a bit more than this more common blue roof light version. 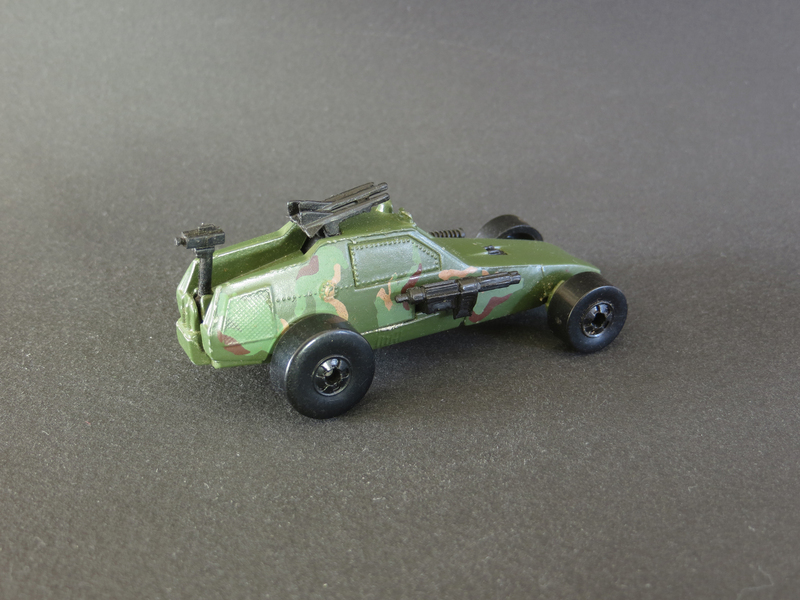 The casting was also released in 1970 with Superfast wheels. A short time after I acquired the Fire Chief car, I saw this Matchbox Ford Galaxie Police Car on eBay. I put in a bid and was somewhat surprised to come up the winner for a decent price. The Galaxie Police car also has a more valuable variation – one with a blue roof light. Interestingly, the Police version of the Galaxie was never released with Superfast wheels. 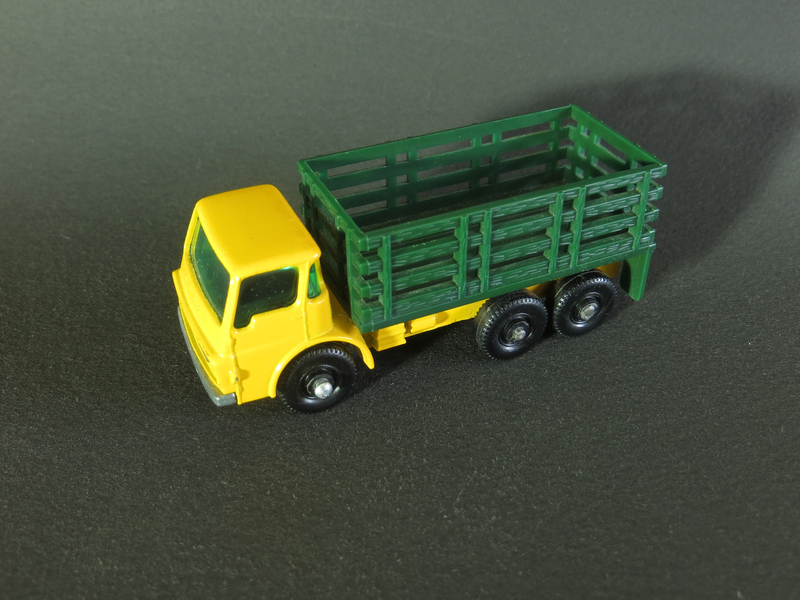 I was interested in this Matchbox Dodge Stake Truck because it’s the precursor to the Superfast version from my childhood. I found this one on eBay and it’s in such great shape that I had to ask the seller if it had been restored (the seller claimed it was all original). This casting first appeared in 1966 as the #37 Dodge Cattle Truck, but it had a more enclosed plastic compartment with an opening tailgate ramp. It also came with two plastic cows. My eBay find is the #4 Dodge Stake Truck, which could be found from 1967-1969 with regular wheels, then from 1970-1971 with Superfast wheels. In 1976 it was reissued as #71 Cattle Truck with Superfast wheels and the two plastic cows (I still have the cows with mine). Since then, there are more than 40 variations continuing up until 2000. The Matchbox Land Rover Safari first appeared in 1965. The regular wheel versions can be found in green with brown luggage, blue with tan luggage, gold with tan luggage, and blue with brown luggage like this nice model I nabbed on eBay. In 1970 it was given the Superfast treatment and has been seen in metallic gold and the considerably more valuable bright blue. The real life Land Rover was born out of conditions in England following the second World War. Rover had been manufacturing luxury cars since 1901, but their factory in Coventry had been destroyed by enemy bombing. 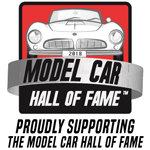 In 1947, now in a former aircraft engine factory near Birmingham, the company needed to create cash flow so the company could re-start its car production. Inspired in part by the Willys Jeep commonly seen in England during the war, Rover came up with a plan to temporarily produce a light agricultural and utility vehicle. The flat, easy to produce body panels were made of aluminum because steel was still being rationed. Early colors were dictated by an abundant supply of surplus military cockpit green paint. The sturdy “box-section ladder chassis” required a simpler welding process. When car production started up again, the Land Rover proved to be a better-selling product and eventually became the landmark brand that continues today. 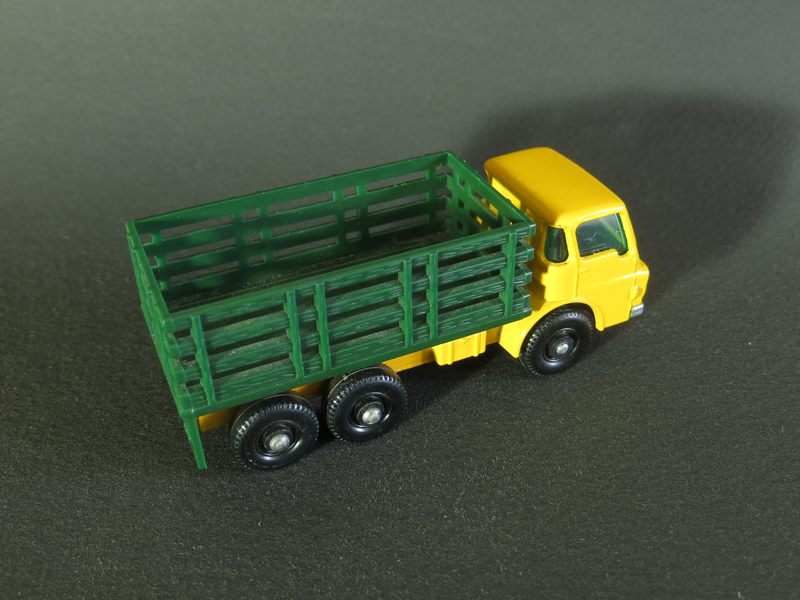 This Matchbox model represents a Series IIA 4-door model with the signature Safari roof – actually a second skin fitted on top which kept the spartan interior cool in warm weather and reduced condensation when it was cold.